Inspired by the work of V.C. 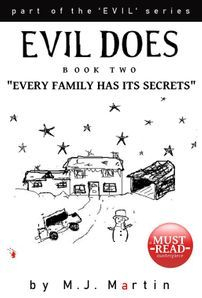 Andrews and Stephen King comes M.J. Martin's edgy new gothic family horror 'EVIL IS' and sequel 'EVIL DOES'. Click here for more videos including "On Writing" interview. Glasgow's acclaimed female fronted rock band ERIC & THE BUNNY BOILERS - led by singer/songwriter and guitarist Michelle (M.J.) Martin have announced their return to the UK music scene, with a brand new studio album and live dates. Follow the band on Twitter and Facebook for news and updates. Hotly tipped new TV drama NINETY EIGHT PERCENT has entered pre-production in Glasgow this week, set to be produced by Bad Pony Media. The series, featuring a strong and almost all female cast will be globally syndicated - and set to shock audiences with a mix of black humour and strong social-issue led storylines. For more details visit www.ninetyeightpercentseries.co.uk. Get your hands on a copy of M.J. Martin's chilling gothic horror EVIL IS by joining her new Instagram. A winner will be chosen every week throughout June. As well as the chance to win one of 5 x copies of the book, you can also join the author for lunch and on set of her new TV drama NINETY EIGHT PERCENT. Visit @mjmartinwriter for more info.